Doub McClure stars in an enjoyable Amicus adventure flm based on Edgar Rice Burrough's novel. Cinema Club UK R0 DVD. With the British horror boom of the 1960s rapidly coming to an end in the light of new and daring horror films from Italy and America, Hammer and Amicus would look to move into other fields. While Hammer resorted to low budget television spin-offs, Milton Subotsky and Max Rosenberg tried to move into the family adventure film market. Edgar Rice Burroughs' 1918 novel owes a large debt to Jules Verne's The Mysterious Island, and Arthur Conan Doyle’s The Lost World of which this story seems to be a direct combination, although with the addition of an elaborate evolution-in-action concept on the island. 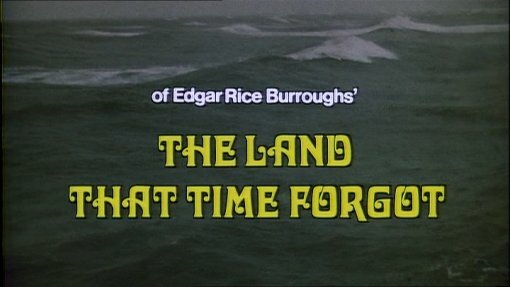 The film opens, like the novel, with a war movie setting and the first third of the film is entirely dedicated to getting the characters to the eponymous Land. These scenes are effectively done and rather like Hammer's earlier adventure film The Lost Continent (1968), could be a film entirely on its own - unfortunately the short running time of this section does not allow as much characterisation as could have been hoped for, but it is certainly well paced. On arrival at the island however, the film slows down somewhat with an overemphasis on the island's prehistoric creatures, leading to an almost comic number of scenes of the sailors killing dinosaurs, on more than one occasion, for no obvious reason. Fortunately the pace does pick up with the discovery of a primitive human and an expedition deep into the island to find oil, providing plenty of action with the discovery of different levels of human tribes. Burroughs' complex evolutionary metamorphosis theme was only lightly covered in his first novel and the screenwriters only touch on it occasionally, but then inexplicably decide to try an explain it all in a quick piece of baffling exposition. The film builds to an explosive volcanic climax that was invented for the screen (or stolen from One Million Years B.C. (1966)) that is certainly exciting although dragging on a little too long, fortunately the novel's coda is retained and neatly wraps the story up. The British director Kevin Conner took the director's chair here and does a decent job considering the film's low budget. The opening third, in the submarine is nicely done with a claustrophobic set and some good model shots. The dinosaur scenes are filmed with rod puppets which do look slightly more realistic (not necessitating as much rear projection work), but lack the charm of the classic Ray Harryhausen style stop motion. The soundtrack is a relatively standard orchestral affair from long term Amicus composer Douglas Gamley, it suits the film well. Popular American television actor Doug McClure certainly looks the part as the burley Bowen and gets plenty to do, unlike the lovely Susan Penhaligon who is very underused as Lisa (unlike Hammer's dinosaur adventures, Amicus elected not to insert gratutious river-bathing scenes). John McEnery is good as the German submarine commander, although for some reason he is over-dubbed by Anton Diffring (who would have been equally good in the role). The Land that Time Forgot is a perfectly enjoyable adventure film with an effective opening third and some entertaining dinosaur sequences, although it is let down somewhat by a script that does not build as much characterisation as it could have and does lose pace in a few places. Anyone famous in it? Doug McClure - American television and movie star who appeared in all of the Amicus fantasy films. Directed by anyone interesting? Kevin Connor - a lesser known British director who filmed most of the Amicus fantasy films and more recently worked on the impressive Frankenstein (2004) mini-series. Any gore or violence? Some blood. Who is it for? Of interest to fans of classic adventure films. The print is decent with good colours and minimal print damage but very heavy grain, slightly soft in a few places. Brief manual scrolling still photo gallery. Brief text biographies for actors Doug McClure and John McEnery, director Kevin Connor and Edgar Rice Burroughs. Availability Released as a single disc as detailed here, or the same disc is available as part of the Doug McClure Collection boxset. Other regions? Available on a similar disc in Germany and part of the Midnite Movies series from MGM in the USA, in a double-bill with the sequel The People that Time Forgot (1977) but without the documentary feature. Re-released by Studio Canal in the UK with new cast and crew interviews. A enjoyable adventure film, although some improvements on the script might have helped. A decent looking DVD with an interesting documentary piece, although the lack of trailer (included in the US and German discs) is a pity. Find more reviews of Amicus Films. All text in this review written by Timothy Young - 27th December 2006 and updated 4th November 2012.